The traditional Western Wall Menorah lighting ceremony on Thursday night was dedicated to Holocaust survivors. 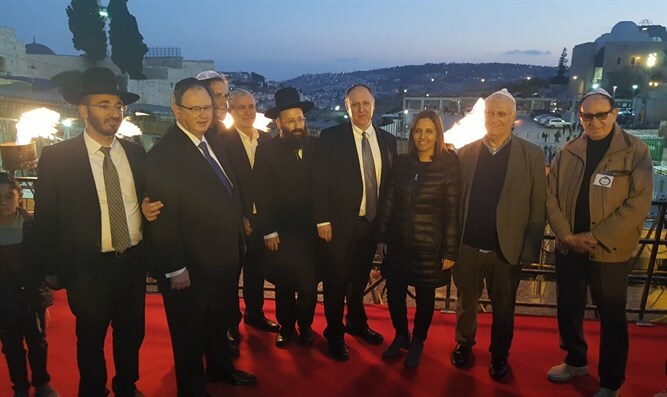 The ceremony ushering in the third night of the Hanukka holiday was attended by hundreds of Holocaust survivors and their families, as well as Social Equality Minister Gila Gamliel, Rabbi Shmuel Rabinovitch, Chief Rabbi of the Western Wall, and Migdal Haemek Chief Rabbi, Dovid Grossman. "I stand here today...in the holiest place for our people, and in Jerusalem, celebrating the 50th anniversary [of its unification], and in our country, Israel," said Pnina Katzir, 88, who represented the Holocaust survivors. "Israel [will] celebrate its 70th anniversary this [coming] year and we can't find suitable words to describe the magnitude of the event and its significance for Holocaust survivors." "We survived because of our strong desire to live, because we expelled despair and because we believed that better times would come," continued Katzir. "We went to Israel and established families, that is our pride and our victory," she emphasized. "The Holocaust survivors who are still with us are like a fire which illuminates the way," added Greg Schneider, who is the Director General of the Claims Conference. "We must commemorate the stories of heroism and the tremendous contribution from those who have had everything taken from them." Gamliel spoke about Jerusalem's importance to the Jewish people and hailed President Trump's recent decision to recognize Jerusalem as Israel's capital. "The United States, the world's greatest superpower, led by President Donald Trump, is the first to have recognized the capital of Israel," she said. "These days we will once again remind ourselves and the entire world of the ancient saying we say under the marriage canopy. "If I forget thee, O Jerusalem, Let my right hand forget her cunning.Let my tongue cleave to the roof of my mouth, If I remember thee not; If I set not Jerusalem Above my chiefest joy."